Mass migration is being engineered by the cabal to create an undifferentiated homogeneous mass of serfs dominated by a new world order. Natural and sustainable immigration happens organically. Economic immigrants, whether legal or not, cannot be blamed or demonised for looking for a better quality of life. And genuine asylum seekers who escape war zones and civil wars created by any aggressor including western/Nato countries should expect our sympathy and help and be given refuge in the nearest safe country or countries as set out in international law. But it isn’t that simple. Sadly there are political leaders and planners who seek to create and use mass immigration and the forced movement of people for their own nefarious purposes. ‘Replacement Migration’ to deliberately bring in at least 56 million people from mostly Africa to Europe by 2050 is a very real and genocidal policy that has already been planned by both the UN and EU since at least the year 2000 – a policy carried out under the auspices of various inter connected globalist agencies and plans such as the International Organisation for Migration, Global Migration Group, The Africa-EU Partnership, World Bankand the cult of international sustainable development also known as Agenda 21/2030 Agenda. As Europe finds itself overwhelmed by incoming hordes of “refugees” and “migrants,” some have turned to what is called the Kalergi Plan to explain why Europe’s political elites encourage and welcome the invasion. One of the main architects of European integration was also the one with a plan for the genocide of European peoples. He is a dark character whose existence is not known by the masses but whom the powerful consider as the founding father of the European Union. His name is Richard Coudenhove Kalergi. While he was alive, he moved behind the scenes, away from the spotlight, and managed to attract the most important heads of state in Europe, who became his supporters and promoters of European unification. In 1922, he founded the Pan Europa movement in Vienna. Its goal is to bring about a New World Order based on a federation of nations led by the United States. The unification of Europe would be the first step towards a single world government. 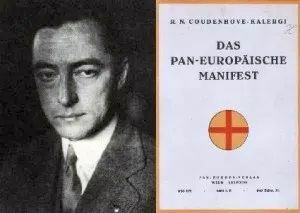 In his book Praktischer Idealismus (Practical Idealism), Kalergi declared that the people of the future “United States of Europe” will not be the original peoples of the Old Continent, but a kind of bestial subhumans made ​​by miscegenation. Kalergi stated in no uncertain terms that you must cross the peoples of Europe with Asian races and color, to create a multiethnic flock without quality and easily controllable by the ruling. [White] genocide is also the basis of the UN’s welcoming policy toward millions of immigrants to compensate for Europe’s low birth rate. According to a UN report released in January 2000, entitled “Replacement Migration: a solution to declining and aging populations,” Europe would need 159 million immigrants by the year 2025. One wonders how it was possible to make such an accurate estimate if immigration was not a well-rehearsed plan. Certainly, Europe’s low birth rate can easily be reversed with appropriate measures to support families. It is equally clear that the genetic heritage of Europe cannot be protected by introducing non-European migrants. On the contrary, mass immigration will only accelerate the disappearance of Europeans. The sole purpose of mass immigration, therefore, is to completely denature a people, turning them into a collection of individuals without any ethnic, historical and cultural cohesion. In short, the Kalergi Plan has been and still is the foundation of the official mass immigration policies of European governments, at the cost of the genocide of the peoples of Europe. Is mass migration blow back for judging others by skin color, customs, their limiting beliefs [mind controlled programming? ], religious dogma, personal preferences that differ from our own.? When individuals tame their emotions long enough to start talking to their perceived enemies, it becomes possible to discover how humans are deliberately pitted against one another to divide and conquer them. Our freedom and survival depend on such a change of mind and heart so please share. All for one and one for all. Thank you.